Reincarnation lies at the heart of the long running BBC TV series DR. WHO. The clever creators of DR. WHO disguise reincarnation, for Christians and Muslims who prefer the belief in an afterlife, as regeneration. When the doctor reaches the end of a useful life in one body he regenerates into an entire new body. Like rebirth in reincarnation, the doctor’s regenerations are painful and chaotic. The Time Lord, last of his race, is always disoriented at first adapting to his new body. Much like we are as reborn babies, starting the life-cycle all over again as we’ve done countless times in the longest running reality show called “Life on planet Earth”. 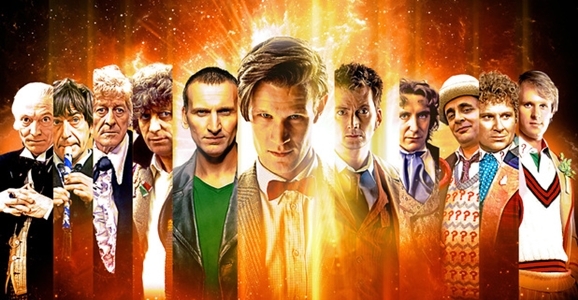 Since 1966 when the series premiered, and soon to celebrate a 50-year anniversary as the longest running TV series on earth, twelve equally amazing actors have played the 2,000 year-old Dr. Who. I have watched so many of these Dr. Who regenerations over my lifetime that it’s hard for me to imagine a life without this coolest of sci-fi shows. Heck, I was only 14 when the show began, though I began watching it on PBS in the 1980s in my 30s during the Tom Baker DR. WHO years. I love how you never know in what form the doctor will regenerate, complete with a new wardrobe style and interior redecorated time machine called the Tardis, bigger on the inside than the outside. An outside that’s supposed to camouflaged into the landscape, but that cool Tardis function is broken. So the doctor’s time machine is frozen in the form of a blue London police phone booth from a desperate 1966 mission to save Earth, just it has been since the show began in 1966 as the only constant in the ever changing Dr. Who series. This broken but still powerful Tardis is the doctor’s only tool, along with his trusty multi-use sonic screwdriver, for saving the world. Which the doctor does every season on regular basis. In season eight, a bit confusing as it would be season 27 but they chose to renumber the series when it revived in 2005 after being off the air since 1996, Clara Oswald, who I feel is hands down the best in 50 years of Dr. Who companions, is beautifully played by Jenna Coleman. Clara is repulsed when the hot young Dr. Who, played by Matt Smith, that she crushes on, is regenerated into a cantankerous old Scott, played masterfully Peter Capaldi, with touching and hilarious results for them both. Thus Clara bridges from one Dr. Who to the next, a process we as the audience all go through too. Yes, every time there’s new doctor the BBC message boards are filled with dislike for any new Dr. Who. But soon we fans, along with Clara and her predecessor companions, are comforted by the fact that, despite Dr. Who’s new look, that he demonstrates by action and character he remains the same vibrant world saving hero underneath the skin. The same soul living in a new body, just as in reincarnation, Dr. Who continues to grow and develop new complexities of character and compassion, while he is constantly humbled and rescued many times by his human companion. An incredible metaphor for relationships that are the key to our souls’ evolution in reincarnation. It’s wild how the show makers masterfully overlap all the Dr. Who’s and along with his change of companions like 2015’s Clara. Just as we do in real-life, if you believe as I do in the endless cycles of reincarnation. We mortals are constantly changing lives in an immortal cycle of regeneration. Like the water of lakes that vaporizes to fall as rain endlessly, we are ever dying and reborn, re-meeting our companions of the past, sometimes as human beings and sometimes other life forms, all mostly made of water. In other words, dear dreamers of a better tomorrow, we are all Claras and Dr. Whos in a Tardis called Me. This blog posting dedicated to a real-life Dr. Who I have had the honor of helping bring a new sonic mind tool into the world called the NEO Neurophone, Dr. G. Patrick Flanagan.